The man in charge of the Russia investigation will have to wait to find out whether the president will fire him. WASHINGTON — Rod Rosenstein is safe, at least until next week. President Donald Trump delayed a meeting scheduled for Thursday that might have resulted in the dismissal of the deputy attorney general and thrown into jeopardy the Russia investigation he oversees. "The President spoke with Rod Rosenstein a few minutes ago and they plan to meet next week. They do not want to do anything to interfere with the hearing," White House press secretary Sarah Sanders said Thursday, referring to the Senate hearing on allegations of sexual misconduct against Supreme Court nominee Brett Kavanaugh. After days of speculation that he was preparing to fire Rosenstein, Trump said at a press conference Wednesday that he would "much prefer keeping Rod Rosenstein." Trump has often criticized Department of Justice officials for allowing special counsel Robert Mueller's Russia probe to continue, and a New York Times report last Friday could give Trump cause to dismiss the man supervising it. The Times reported that, after Trump’s firing of former FBI Director James Comey last year, Rosenstein suggested to colleagues that they secretly record the president and that officials considering invoking the 25th Amendment to remove Trump from office. Rosenstein, a Republican appointed by Trump last year, has denied that he ever pushed for Trump's ouster, and said that his comments about recording the president were made in jest and offhand. A phone call with Rosenstein this week seemed to reassure the president. "We've had a good talk. He said he never said it, he said he doesn't believe it, he said he has a lot of respect for me and he was very nice, and we'll see," Trump told reporters Wednesday at the United Nations. Rosenstein is no longer talking about resigning, two friends who have spoken with him this week told NBC News. He had discussed the prospect with friends and White House officials over the weekend, but has told his friends he wants to be sure the White House believes his denial of The New York Times article. 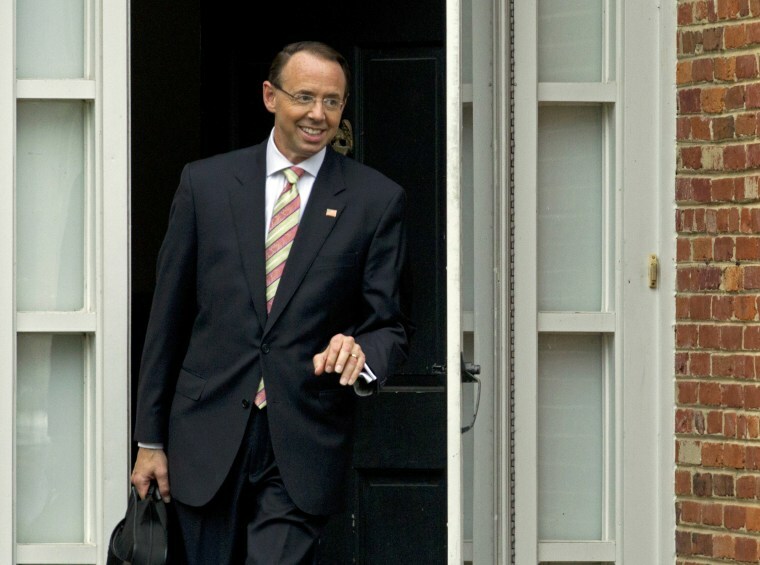 One friend believes the delay of their meeting only spells good news for Rosenstein. Trump will now have had time to speak to his advisers, including chief of staff John Kelly, who showed his support for Rosenstein in a public handshake in the driveway by the White House on Monday. The idea of firing Rosenstein has divided Trump allies, and the former “Apprentice” host has often dragged out White House personnel decisions as he weighs his options and builds drama. Democrats and others have raised the alarm that firing Rosenstein could be an attempt to shut down or weaken the Russia probe, and have promised it would set off massive public demonstrations. Attorney General Jeff Sessions recused himself from the investigation into Russian meddling in the 2016 presidential election and potential collusion with the Trump campaign, leaving Rosenstein in charge of Mueller's team.